I was watching TV recently and two different shows reminded me of my greatest woodworking pet peeve. But before I go into that detail, let me offer some back ground as to what my issue is and where it originates. My love of woodworking really exploded when I was introduced to the world of exotic woods through a show called “Woodworks”. The host of the show, David Marks, was always using woods that I had never heard of. Each wood was uniquely beautiful and boasted colors and grain that I had never seen before. From that point on I was sold, and decided to only offer things done in natural wood with a clear finish to protect it. 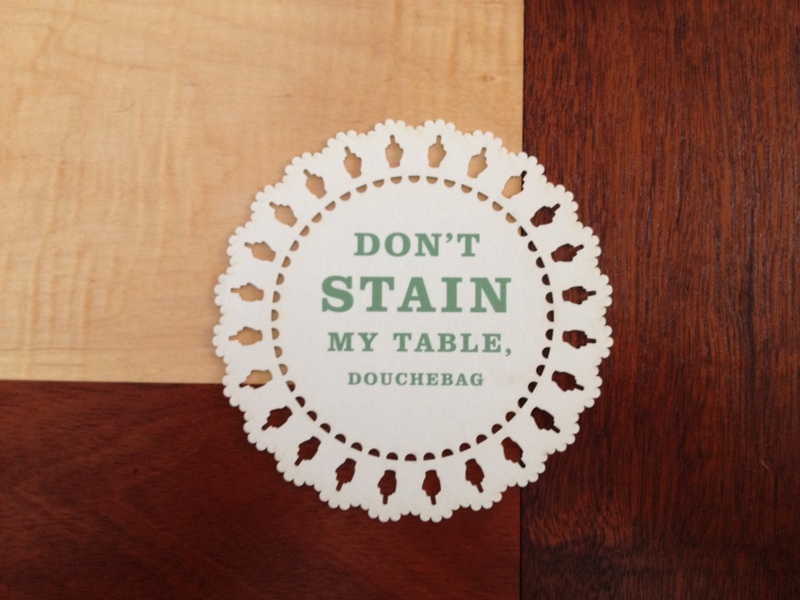 “Stain” is a dirty wood in my house, because stain is just that…. Dirt. I don’t want you to rub dirt on the finely crafted work that I created, so why would you want me to? It is probably one of the most common questions I get asked: “what color are you going to stain it.” The question is asked as though staining is how wood is always finished. So I make it my goal to educate people to not cover up their beautiful wood, but rather appreciate the variety that exists in nature. Now, this leads my pet peeve. I was watching a recent show of “Son’s of Guns” on the Discovery Channel were they were building an old fashioned looking gun called a “blunderbuss”. As part of the build they were restoring an old walnut stock and they used a walnut stain to “bring out the natural beauty of the wood”. Really? 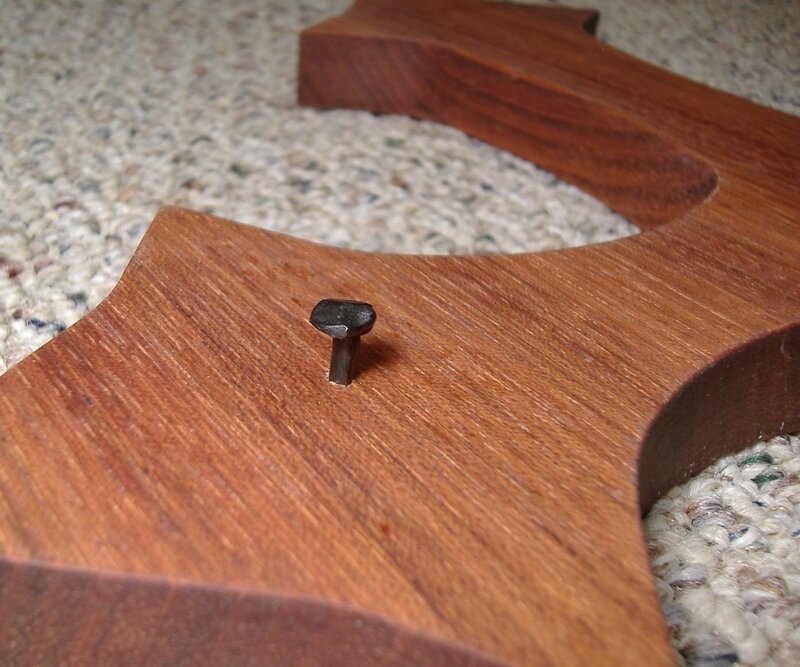 You are going to take a piece of beautiful walnut wood and then use a “walnut” stain on it? You are already at your end goal of a walnut colored stock by virtue of nature and dirt in the stain will actual hinder some of that beauty, not highlight it. I can’t be too mad at them, they are gun people not woodworking people. The other show was “The Vanilla Ice Project” on DIY network (yes, the 90’s rapper). They are rebuilding a million dollar house and bring in 3 huge and beautiful African Mahogany planks and promptly gave them a “nice dark stain.” Mahogany is one of my favorites to work with and has a beautiful color and grain pattern. 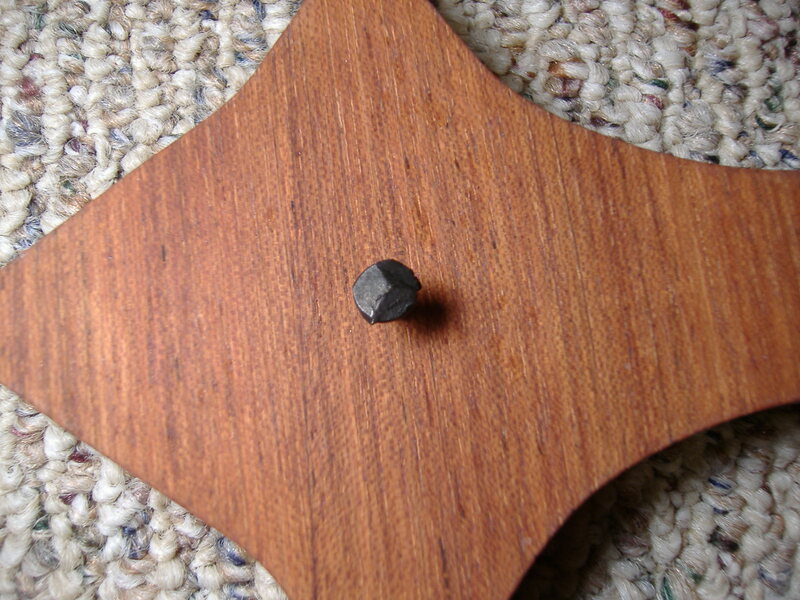 Mahogany will naturally darken over time, but rubbing dark dirt on it is no way to do this. If their end goal was to have some dark wood, they could have slopped some stain on some cheaper Oak wood. I have worked with design and styling people before, and to be honest, they aren’t known for their practicality. They are just trying to make real life match their vision. I can respect that, but I bet they could have achieved their vision with another species of wood had they known, maybe they should consult me next timeJ. Even professionals can fall victim to this as well. I remember early on in my woodworking “training” watching an episode of “The Old Yankee Workshop” were Norm made a “Mahogany poker table” and the last step involved “mahogany” stain. That pained me greatly! Although, I also don’t pump finish nails into my project either, everyone has their own style – it is just not one that I agree with. Maybe when PBS offers me a show we can revisit that table and do it the right way. So the moral of the story is, don’t stain my wood. If you are looking for a Mahogany/Walnut/Cherry finish, then I’ll start with those woods. Also, stain can’t alter the look of the wood grain, so you end up with a similar color, but not the natural hues and features that come from nature. The natural wood will look better and stay looking better longer then some colored dirt rubbed into the surface. If you want something that stain can’t match, use some exotic woods like Cocobolo, Zebrawood, or Wenge (just to name a few). No stain will ever match these woods and while pricey, they are truly spectacular! 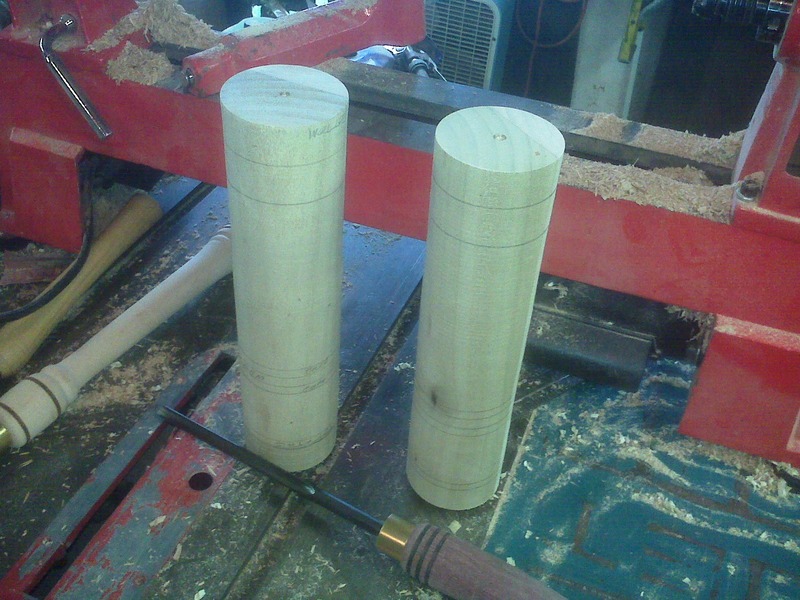 The third step in making a pepper mill sounds like a simple one… just drill the holes. People drill holes all the time and it just takes a few seconds right? These holes, however, take a little more care and attention. These specific peppermill styles require 4 different drill sizes, they need each to be drilled to specific depths, and you want them to be dead centered. 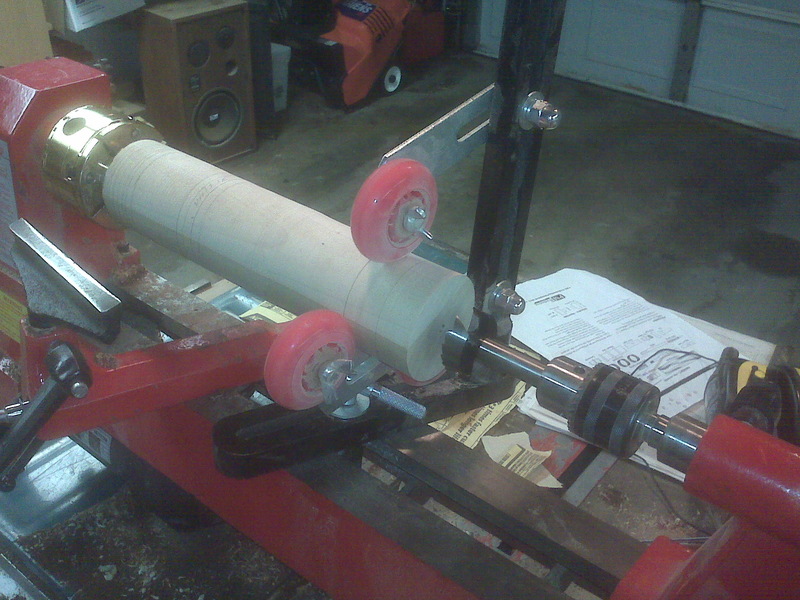 In order to drill the holes I opt for a rig that involves a tool called a steady rest (see picture). This allows me to support the far end of the pepper mill while drilling. Some may consider this over kill, but I find that the additional support helps to keep the drill bit centered by eliminating wobble at the far end. 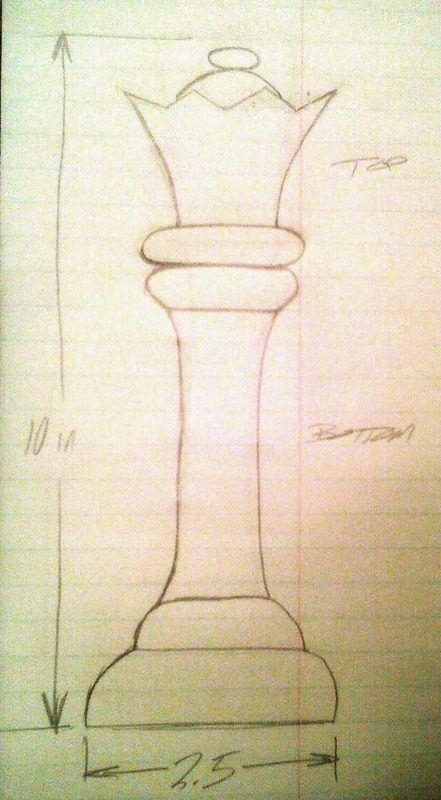 A shorter peppermill (4-6″ tall) is usually not a problem, but a taller one (they go as high as 24″!) will generate more wobble. The steady rest also keeps things from becoming air borne if an accident should happen. Once drilling begins, care needs to be taken so that the bit doesn’t over heat and burn the wood or wander off-center and drill crooked. The only way to do this is with time – slow and steady wins the race here. Drill slowly and clear out the wood chips as you go. Soon you will be all done and you’ll be on to shaping the outside. That is where all the fun is and it won’t be long now! I have had dozen of requests for custom work for all sorts of things. Many of these request have been initiated, sight unseen, without any real knowledge of what the final project will be. Granted some of the items are simple in nature, and others are not very big or expensive projects, but some of them can be. It is an honor that people put that much faith in my work based on other items that they have seen, but not everyone is that brave. So say you are looking for a custom piece of furniture made for your exact needs and are investing hundreds (or thousands) of dollars into a high quality piece of work made from exotic woods. Wouldn’t you like to have an idea of what you can expect the end product to look like, especially if the item is different than any of the other previous works done by the craftsman (hopefully that craftsman is me…). I have a solution for you! Working closely with you I can generate a scale 3D model of what you are looking for so that you can have a better idea of what you will be receiving. I can even apply wood color for the specific woods that you are looking to use to give you an even more representative image of the end product. 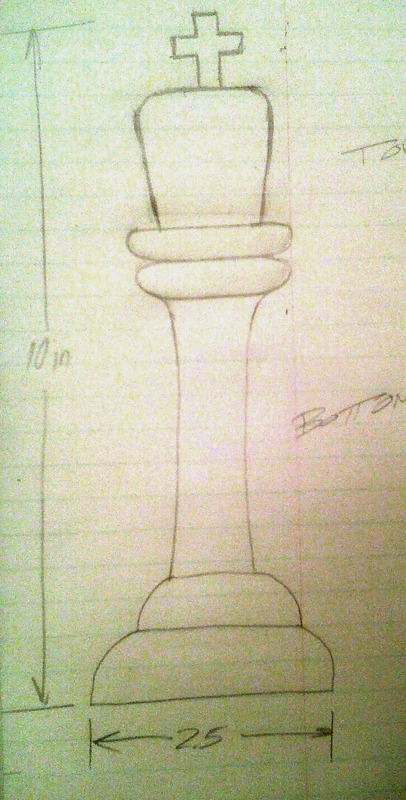 Now this certainly isn’t exact because wood can vary from piece to piece, but at least is in the ball park. An additional advantage of going through this step is that we can see if something just doesn’t look right, maybe parts are out of proportion with the rest of the piece, or something is too small to really make a difference. 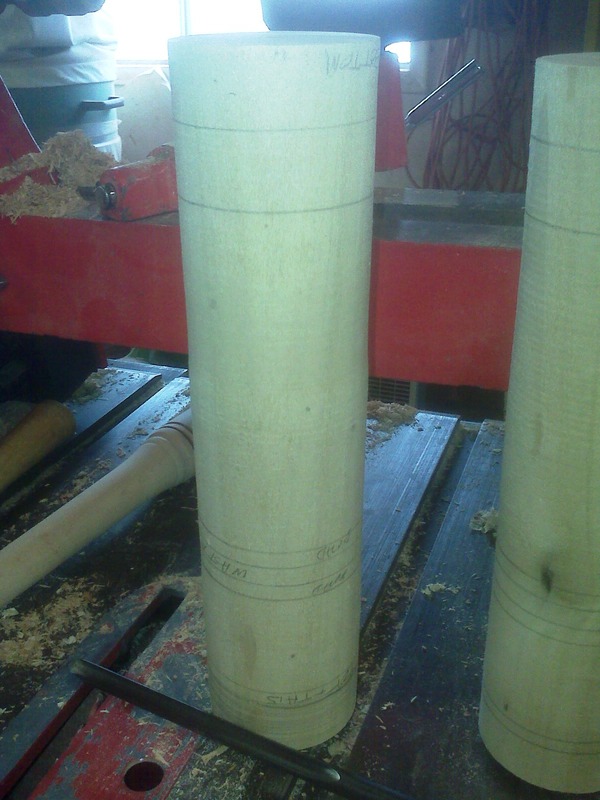 We can make that adjustment before any piece of wood is cut and produce a better product in the end. I also like to do this for my benefit because it helps me think through the joinery for the project and determine the length of parts, especially when working with mortise and tenon joinery, it is easy to forget to add the length of the tenons to the overall length of the piece that needs to be cut. On this project the cross was too detailed to fully capture it in the 3D, so a more basic cross of the approximate size was used as a place holder. Also, you can see how the wood grain generated on the front of the table doesn’t match the grain of the actual piece. So fear not! If you would like to commission me to build you a custom piece I will work with you from start to finish to make sure you get exactly what you are looking for. Well it is about that time of year.. everyone takes a break from their busy lives to take some time and reflect over the previous year. In this time of reflection we check to make sure that we have paid all of our taxes to Uncle Sam… ahhh quality time. Now hopefully if you have to write a check, it is a small one. After all it is depressing to see how much we pay in taxes throughout the year, to have to cut a check at the end feels like smack in the face. But on the other hand if you did receive a refund it is like bonus money. Yea, I know it is really MY money that over paid to the government, but it is still nice to get an extra check… so BONUS! So since many of you may have received your tax refund (or will soon) why not consider purchasing a custom item made specifically for you. Maybe you need a large cutting board or salt and pepper mill set for the kitchen, a new foyer table made to your specific dimensions from exotic wood, a blanket chest to be a family heirloom, a high-end pen, or any other things that we offer. Why not consider using some of this “free” money and spoil yourself! Let me know if there is something that you are interested in and we can make your vision a reality! As promised last month, here is a look at the gift I made for my wife’s birthday. This idea has been in my head for over 2 years, and although it isn’t that complex, I’m glad I was able to finish it. 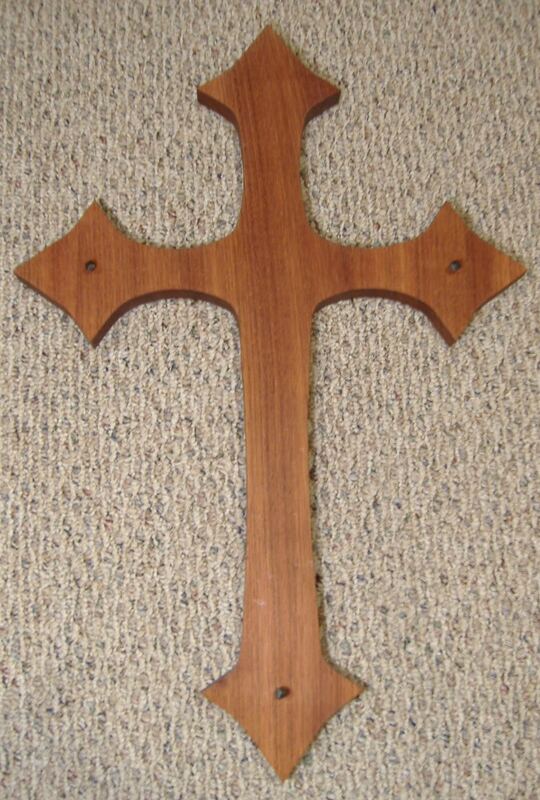 Religion is an important part of our lives and I have made a few more simple crosses in the past. This one is a little more fancy than a traditional straight cross. 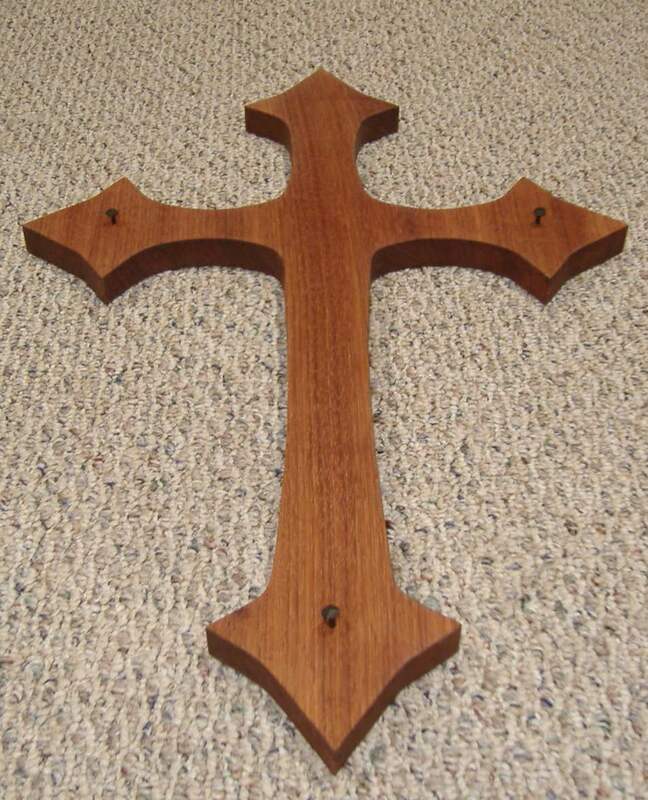 Although you have probably seen a cross of this style before, this cross was 100% designed and drawn up by me on the computer and I had some templates CNC cut from the drawing. 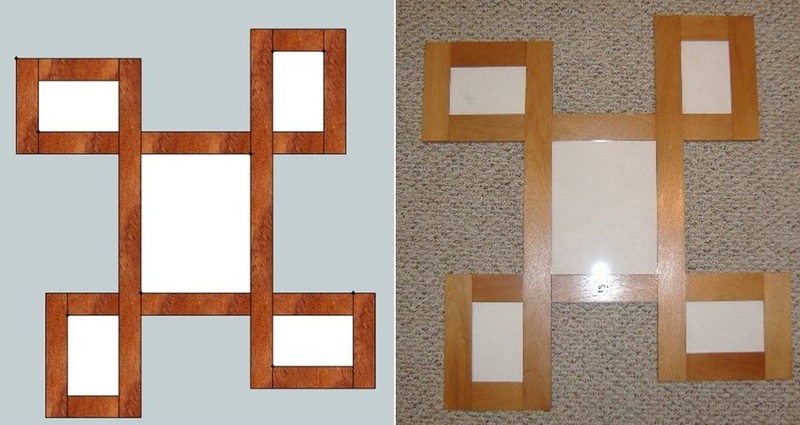 I had plans to try to produce these crosses in a production fashion from plywood and paint them, but that idea fell through for more than one reason. Now I plan on sticking with my focus of using solid hardwood, in this case Jatoba, to do all the talking… no paint allowed! I decided to add some additional detail with some old-fashioned nails, I think the heads of the nails are just the right touch. I gave this cross several coats of a hand rubbed 100% tung oil finish. Now my mother-in-law wants one… A great Christmas idea for next year!! Or maybe even Easter. Of course you can always order one for your self in just about any wood, just ask!